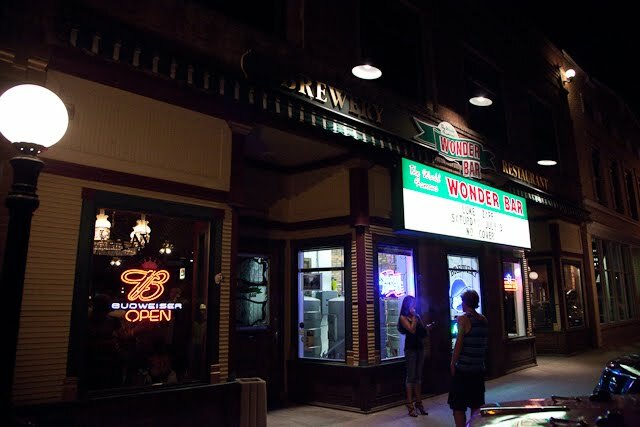 Wonder Bar in Casper, Wyoming is way more than a burger place. My friend Teresa took me there to get a burger on a Wednesday night and the place was hoppin’. (For those of you not from the Midwest, hoppin’ means there were a lot of people there having a good time.) We went through the lively bar with its live music and sat in the restaurant. Our very attentive server took our orders. 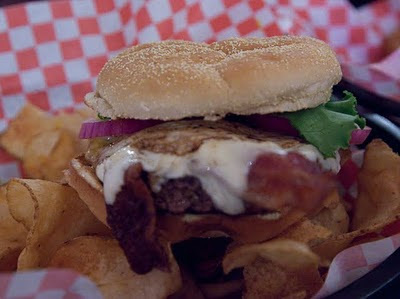 I had the Roadhouse Burger ($8.99). A half-pound Weinrich Meat fresh ground patty topped with a fresh jumbo fried egg, bacon, Swiss cheese and served with Miracle Whip; not just mayonnaise. The bun was a Kaiser type bun, soft and nicely toasted. The beef was tasty, if slightly over cooked. It also included fresh onion, tomato and lettuce. The egg was fried hard. I would have preferred it slightly runny. The bacon was crisp and tasty. Overall it was a nice tasting burger, but I would tweak it by having it cooked a little less and having the aforementioned egg, runny. Teresa had a Patty Melt Burger $7.99 and was quite pleased. One nice twist is that they include house made, freshly seasoned potato chips with the burgers instead of fries. We found these quite addictive, salty and crisp. 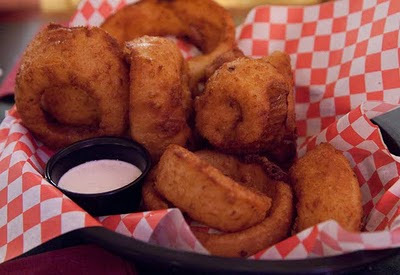 We also ordered onion rings ($6.49). These beer-nattered beauties were very tasty, crunchy and hot. Yum. Reading up on the Wonder Bar, they have a nice history in Wyoming. Founded in 1942, a cowboy could ride his horse right up to the bar and get a beer for both he and his horse. They had actual pictures to prove it. You gotta like that.